Major improvements and optimization of the tree database subsystem, leading to faster and more reliable trees. A new and powerful analysis feature, based on IDeA tree generation strategies. Pick one of the predefined strategies that come with Aquarium 2016, or create your own and generate trees based on any pattern you want. Read review by Dadi Jonson. Queries to the online 7-piece tablebase server are processed much faster than in previous versions. Numerous other minor changes and fixes, for example, Ctrl-X hotkey deletes all "Sent to server" move markers in the game score. 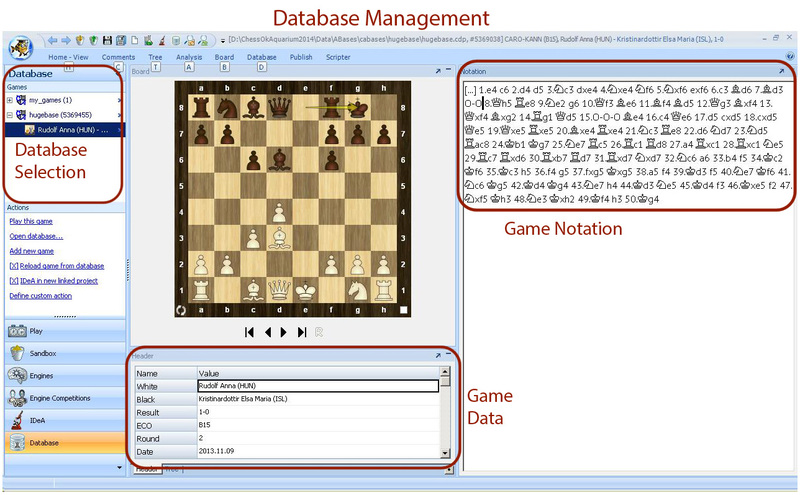 ChessOK Aquarium 2016 offers advanced analysis functions, game commenting, searching, powerful chess trees, playing, databases and much more. If you already own the Houdini 4 UCI engine and are looking for an appropriate interface, ChessOK Aquarium 2016 is the best you can find. Interactive Deep Analysis is the the most advanced chess analysis method available today. 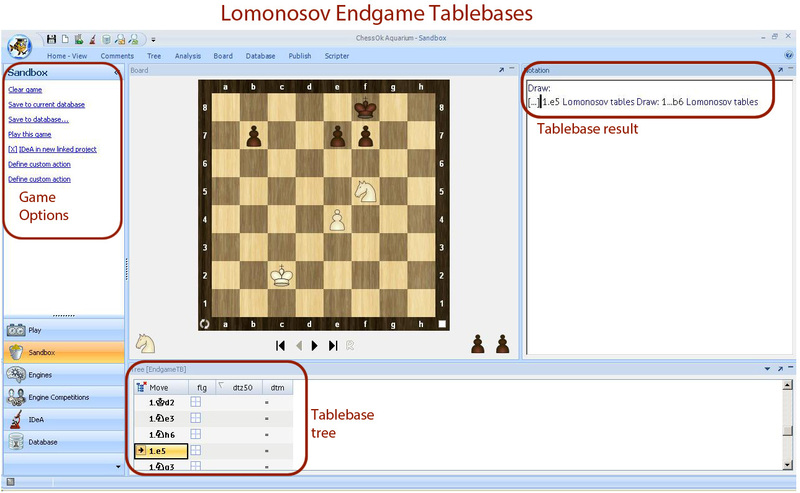 You receive access to 7-piece Lomonosov endgame tablebases via the Aquarium interface or attb7.chessok.com until July 1, 2017. 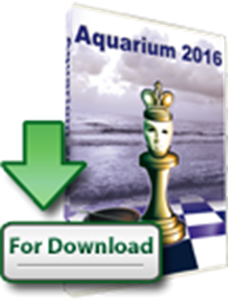 ChessOK Aquarium 2016 can auto-find chess programs (including the strong Stockfish engine) on the Internet, download and install them - all in a couple of clicks. Databases of about 6.55 million games in total (up to June 1, 2016) that can be updated from www.chessok.com each week with 1500 new games for free. Language versions: English, German, Spanish, Italian and French. System requirements: PC, 256 MB RAM, 4GB of free disk space, Windows 10/8/7/XP/Vista. Internet access to access Lomonosov Tablebases. ChessOK Aquarium is a revolutionary analysis, database and chess publishing tool, fully compatible with the world’s strongest chess playing engines, including Houdini 4. ChessOK Aquarium combines an easy-to-navigate interface with advanced analysis functions, game commenting, searching, powerful chess trees, playing against the computer, databases, advanced publishing options and many other features. One of its unique features, Interactive Deep Analysis, is the most advanced chess analysis method available today. The purpose of IDeA is to analyze a position deeply and return as much information about it as possible to enable the user to get a better understanding of the nuances of any position. Its unique approach makes it an essential weapon in the arsenal of every serious player and analyst! ChessOK Aquarium was developed by Convekta Ltd, widely known for such famous programs as Chess Assistant and CT-ART. Those of you who never used Aquarium should definitely consider trying out this most advanced chess interface. Despite having numerous functions and customization options, Aquarium is easy to use navigate - thanks to a modern interface employing the Ribbon - an element you may be familiar with from the latest Microsoft Office products and some other modern programs. It provides means to make all options easily accessible without limiting the number of options. Aquarium comes with a good selection of graphical customization options, allowing you to choose styles for board and pieces. Visual annotations are an effective tool to recall your thoughts about a position and quickly remind you of its most important features. They are also essential for creating video lectures and very useful for live commentary. One of the unique features of Aquarium is that it stores your infinite analysis results. If you run into the same position, even in a different database and even if it came up through a different move order, you can see that you have analyzed it before. Besides examining the result you can insert the variation and evaluation into the game you are currently viewing. You can also add a column with the infinite analysis tree to a tree configuration, so you can always see the evaluation of the different moves in the tree window. If you use multiple chess engines, the analysis results and trees can be stored separately for each engine. IDeA is one of the most advanced methods available for analyzing chess positions. In fact, it is more of an analysis environment rather than a simple analysis feature. Similar to “infinite analysis,” IDeA continues analyzing until you decide to stop it; however, the similarities end there. Instead of analyzing the same position forever, IDeA behaves like a strong chess player analyzing a position. If you ever studied Kotov’s Think Like a Grandmaster, you no doubt remember his well known advice to identify candidate moves and methodically examine them to build an “analysis tree.” This is how IDeA works. The purpose of IDeA is to dig deeply into a position and return as much information about it as possible. 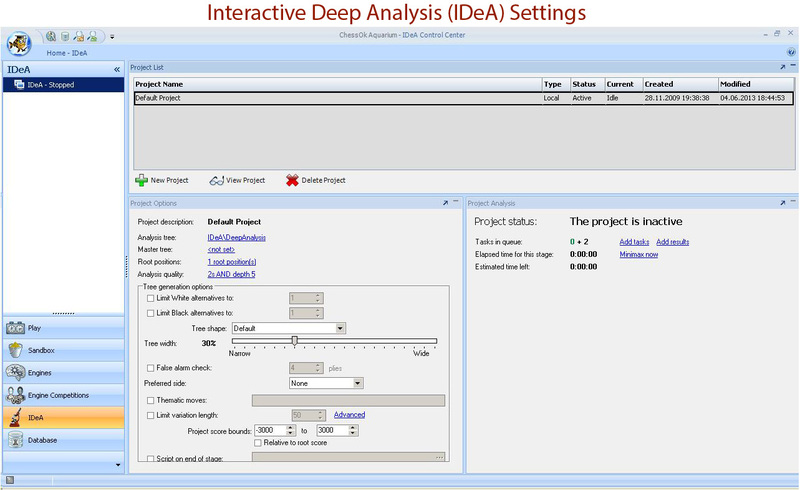 IDeA keeps its analysis in a tree structure which is unlimited in size and the user can browse at will, even while the analysis is in progress. Besides having a live view of how the analysis is evolving the user can also direct the analysis into the most interesting positions by excluding or adding positions and variations to the analysis queue. In short IDeA is a highly selective search controlled by Aquarium (and by the Aquarium user). Interesting lines are analyzed deeply but weak moves are only considered briefly or not at all. There is no doubt that Interactive Deep Analysis is a very powerful tool in the hands of the serious chess player. The biggest news introduced in Aquarium is the improved integration of IDeA and infinite analysis. The first steps in this direction were taken in Aquarium 4. The most important of those was the introduction of IDeA game links (see IDeA Master Trees and IDeA Game Links), which added a new level of convenience by creating an "analysis center" where IDeA is accessible along with other Aquarium analysis tools such as infinite analysis, without the need to switch back and forth between the game and IDeA. Aquarium takes the integration one step further by sending infinite analysis results automatically to the IDeA queue or even directly to the IDeA project tree without the need to re-analyze the positions in IDeA. This means that if you run infinite analysis in a game linked to a project, the variations produced by the engine will be compared to the positions in the project tree; and if they haven't been analyzed, they will be sent to IDeA. The infinite Analysis in Aquarium is as solid as ever. In fact the users that gain most from the improved analysis features in Aquarium 2016 are those who use infinite analysis. With the improvements in Aquarium 2016 you can automatically keep track of all your infinite analysis broken down by chess engine. If you want to check a previously analyzed position at a later time, you can see how it was evaluated by each of the chess engines used to analyze the position. Even if you prefer infinite analysis and never use IDeA, additional options give you a good reason to look into IDeA once more. At no extra cost in time you will get a tool to monitor your infinite analysis and permanently record the results in a way that makes them easy to access and view in the Tree window. After some brief customization IDeA will not generate any positions on its own and the only positions it will process are positions that you send to it, either manually or automatically from infinite analysis using one of the options described above. In this case you would add the infinite analysis positions directly to the project tree. Exporting iBooks and games in Aquarium is a matter of few clicks if you need to do it fast, but also allows for advanced customization in case you want to adjust the design for your site or blog. You can save your custom settings. For more information and detailed guides, refer to the related articles atchessok.com. The ChessOK Playing Club (also known as Chess Planet or ChessOK Playing Zone) client is included in the basic Aquarium installation package. ChessOK Playing Club is a chess server where you can play opponents all over the world for free. 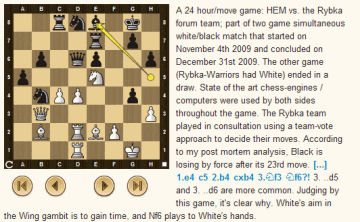 Besides offering the usual time-controls for shorter games, this site has great support for correspondence chess with new tournaments starting all the time. New in this version is support for Fischerandom or Chess960 games. Most its features are completelty free, but buying Aquarium also gets you one year of free membership in ChessOK Playing Zone. I've been looking at the CAP analysis that comes with Aquarium 2016. For those who are not familiar with the CAP project, it is a chess tree (position database) with chess engine evaluation of fifty-five million positions. Each position is analyzed for one minute and the results are minimaxed. IDeA users will probably realize that the quality of such analysis can be quite good and in general the CAP evaluations after the early opening seem to reflect the possibilities of both sides quite well. One of the features of the Aquarium 2016 CAP database is the analysis of the first twenty-five moves of all high-rated correspondence games from the ICCF game archive. Therefore, it is worth keeping an eye on the CAP scores while browsing the games. Naturally, a high rated correspondence player can't rely entirely on CAP evaluations when selecting moves. Move selection in correspondence games requires much deeper analysis. However, a key factor in modern correspondence chess is to find positions that are initially evaluated favorably by chess engines, but can be shown to be dangerous after deep and careful analysis. CAP can be helpful in picking out such positions. Deep Rybka Aquarium 2011 nabízí pokročilé funkce pro analýzu, komentování hry, vyhledávání, silné šachové stromy, hru, databáze a mnoho dalšího. Rybka Aquarium 2011 nabízí pokročilé analytické funkce, komentáře her, vyhledávání, silné šachové stromy, databáze a samozřejmě hraní (a mnoho dalšího).